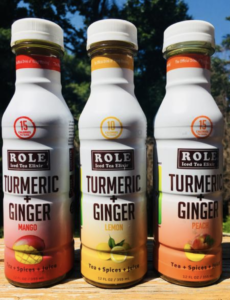 “Function and flavor perfected” is the tagline for Role Tea, a functional iced tea beverage that promises not only numerous health benefits but delicious taste, too. Co-founders Mike Johnson and Koray Benson founded the brand in response to various health issues they were both personally struggling with. Investigating the potential benefits of different herbs and spices ultimately led them to create Role Tea in an effort to help others manage and improve their health. Learn how this brand scored a deal with HomeTown Pharmacy and Hy-Vee through RangeMe while shaking up the functional beverage space. When Johnson began experiencing increased soreness after exercise, he wanted to create a healthy solution. At the same time, Benson noticed how many people around him were frequently using painkillers to manage their everyday aches and pains while consuming unhealthy food and beverages at the same time. Together, the pair was inspired to create a new functional beverage—defined as a drink that also offers health benefits—to alleviate soreness and inflammation. “The functional part usually means it doesn’t have a great taste,” Benson explains. But Role Tea is determined to change that perception. Johnson and Benson teamed up with food scientists and created over 60 versions of their drink before settling on their Role Tea formula, which combines flavored tea, juice, and a variety of good-for-you spices like ginger, black pepper, and turmeric. The most recent iteration of Role Tea has also removed all added sugar from the beverage, which means it is healthier, keto-friendly, and fit for a broader range of customers. While Role Tea is a health-focused drink, Benson doesn’t want it to be exclusive to health-conscious consumers who are already aware of the functional beverage space. After joining RangeMe, Role Tea caught the eye of HomeTown Pharmacy, an independent pharmacy with over 40 locations throughout Michigan and Indiana. At the time, HomeTown Pharmacy was running a health initiative and they were using RangeMe to source new, health-focused products to help their customers, which is how they came across Role Tea and decided to bring the brand into their stores. In addition to that health initiative, HomeTown Pharmacy also holds an annual conference where they bring in all of their pharmacists to make sure they are educated about any new products. This education opportunity turned out to be another huge win for Role Tea. 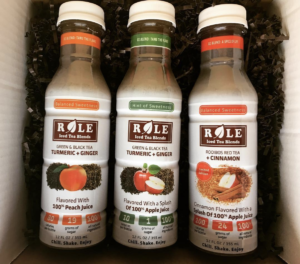 In addition to their success with HomeTown Pharmacy, Role Tea has also been placed in select Hy-Vee locations after connecting with a Hy-Vee buyer through RangeMe, which has been a huge win for the brand. Role Tea is excited to continue their partnerships with HomeTown Pharmacy and Hy-Vee while pursuing additional retailer placements. They are especially interested in connecting with smaller, independent retailers like HomeTown Pharmacy, and finding even more opportunities to educate retailers and consumers about the health benefits of Role Tea. Ultimately, the mission behind Role Tea is to help consumers make healthy decisions, and RangeMe is helping the brand make their functional beverage accessible to a wider audience.